Powerbox, one of Europe’s largest power supply companies, and for more than four decades a leading force in optimizing power solutions for demanding applications, announces the launch of a new series of power supplies for medical applications requiring BF (Body Floating) class insulation and full, reliable operation up to 5,000 meters altitude to power medical healthcare facilities and equipment. Complying with the latest EMI coexistence standard IEC 60601-1-2: 2014 (4th edition) and specifically designed with patient and operator safety in mind, the OBR04 series delivers an output power of 650W. The OBR04 is available in 12 different voltages from 12V to 58V with an efficiency rating up to 91%. With a strong focus on ‘no interference and radio coexistence’, the product meets conducted and radiated EN55011 class B without requiring any additional components. Built to ensure patient and operator safety, the OBR04 has an input-to-output isolation of 4,000 VAC (2xMOPP), an input to ground of 1,500 VAC (1xMOPP) and a 1,500 VAC output-to-ground, when many conventional products offer only 500 VDC isolation. In order to guarantee full operation up to an altitude of 5,000 meters, the OBR04 has been designed in respect of required creepage distances and additional isolation barriers. Many countries such as China or those in South America are bringing healthcare to mountainous region based populations, and it is very common in those countries for healthcare centers and hospitals to be located at altitudes higher than 3,000 meters. Medical equipment must be designed to guarantee the highest level of safety up to 5,000 meters. The base design altitude for power supplies is 2,000 meters but as the altitude increases, the insulating qualities of the thin air diminish and the clearance distances have to be increased from 8 mm at 2,000 meters, up to 11.84 mm at 5,000 meters, thus requiring power supplies to be designed in accordance with the needs of such physical requirements and in some cases to comply with local approvals such as the CCC (China Compulsory Certification). The Chinese Safety Standard GB 4943.1-2011 mandates strict rules for clearance distances and since December 1, 2012 - the primary-to-secondary clearance has increased by a factor of 1.48 to qualify the power supply for operation up to 5,000 meters. 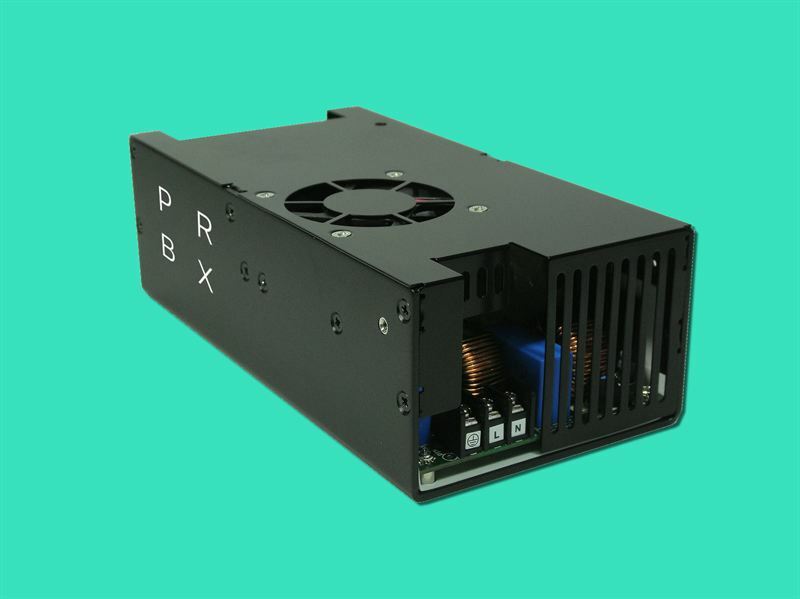 Designed with high altitude applications in mind, Powerbox’s PRBX OBR04 withstands an isolation voltage of 4,000 VAC (2MOPP) from the input to the output, 1,500 VAC (1MOPP) from the input to ground and 1,500 VAC from the output to ground, when most products currently available are offering only 500 VAC. The OBR04 leakage current is 300 µA maximum, and the touch current is 100 µA maximum at 264 VAC and 63 Hz. Powerbox’s OBR04 is available as standard in twelve output voltages; 12, 15, 18, 24, 28, 30, 32, 34, 36, 48, 57 and 58 VDC, covering a large range of applications from 12 VDC intermediate bus voltages through to point-of-loads up to 58 VDC to power the latest generation of power amplifiers. Depending on the output voltage the maximum output power starts at 600 W and rises to 650 W with a peak power level of up to 720 W. An auxiliary 12 V output is provided for an additional fan, as well as a standby 5 VDC supply at 200 mA. The output voltage of the OBR04 is protected against overvoltage exceeding 115-140% of the nominal output voltage and is over-current protected. The power supply also includes thermal shutdown and a TTL interface that provides a power fail detect signal. The OBR04 input voltage spans from 90 VAC to 264 VAC and includes an active PFC, typically 0.98. Exhibiting versatility, the power supply is designed for global operation with an input frequency range of 47 to 63 Hz. The input current at 115 VAC and 60 Hz is 8.4 A (RMS), and 4.2 A (RMS) at 230 VAC 50 Hz. The power supply can be safely operated within a temperature range of -10 to +70 degrees C and stored at -40 up to +85 degrees C.
Housed in an aluminum chassis, the OBR04’s dimensions are 165.8 x 101.6 x 62.5 mm (6.53 x 4.0 x 1.95 inches) and it is available in a ‘U’ shape chassis or an enclosed box with built-in fan. Based on a calculated MTBF per MIL-HDBK-217F, at full load and at 25 degrees C, the OBR04 has an impressive MTBF of 190,000 hours. Targeting demanding application and low EMI, the OBR04 series meets EN55011, FCC and VCCI Class B conducted and emitted standards. It also complies with safety standards TÜV EN60601-1, UL ES 60601-1, CSA C22.2 No.60601-1 and is RoHS compliant. About PowerboxFounded in 1974, with headquarters in Sweden and operations in 15 countries across four continents, Powerbox serves customers all around the globe. The company focuses on four major markets - industrial, medical, transportation/railway and defense - for which it designs and markets premium quality power conversion systems for demanding applications. Powerbox’s mission is to use its expertise to increase customers’ competitiveness by meeting all of their power needs. Every aspect of the company’s business is focused on that goal, from the design of advanced components that go into products, through to high levels of customer service. Powerbox is recognized for technical innovations that reduce energy consumption and its ability to manage full product lifecycles while minimizing environmental impact. Powerbox is a COSEL Group Company. About CoselEstablished in Japan 1969, COSEL is one of the world’s leading designers and manufacturers of high performance AC-DC Power Supplies, DC-DC Converters and EMI Filters. With quality, reliability & flexibility as our main focus, we pride ourselves on developing some of the highest quality and most reliable products seen anywhere in the world today. COSEL is a $284m global company employing some 790 staff with sales offices throughout Japan, Asia, Europe and North America. Designed for medical and high altitude applications, the OBR04 is also suitable for other types of applications such as radio-transmitters and also observatory stations equipment installed at the top of mountains and requiring similar performance levels in term of clearance distances. Also, we see a growing demand for industrial applications requiring higher isolation voltages and for equipment that is designed equally as good as those for altitude applications in order to make their final equipment none sea-level depending.